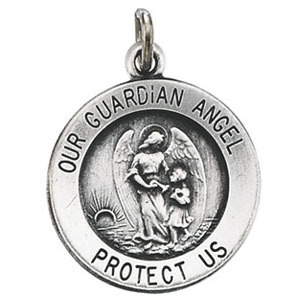 This antiqued sterling silver guardian angel medal dangles from an 18-inch sterling silver curb chain. Dimensions: 18mm x 18mm. Inscription reads OUR GUARDIAN ANGEL PROTECT US. Weighs 5.33 grams. Please note: weight is approximate, actual weight may vary.